Generally, JustOn is set up to issue invoices to one recipient, usually via the account associated to the corresponding source record. Certain business use cases require billing to multiple parties, however - like, for example, in a marketplace scenario. 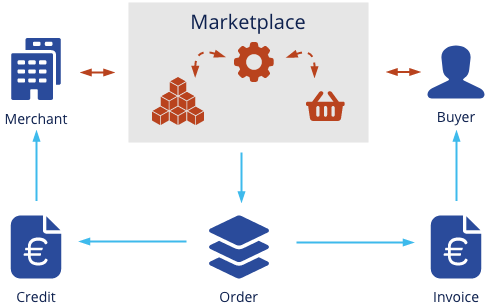 In a typical setup, the marketplace operator connects merchants (the providers of the traded products) and the buyers (the recipients of the products), processing all transactions between these players. Consequently, the marketplace operator bills the same products to multiple parties: they issue credits to merchants for payouts, and invoices to buyers to receive payments. (1) Both merchants and buyers are represented as accounts. (2) For every selling transaction between a merchant and a buyer, you create an order with order products attached. Orders and order products are specifically prepared to be invoiced to merchants and buyers, applying different prices. (3) You execute a generic invoice run that produces invoices from the orders for buyers to request the payment from them. (4) You execute a generic invoice run to produce credits from the orders for merchants to indicate the payout to them. (5) In addition, you can execute another generic invoice run to produce invoices for merchants to request a commission fee (which directly depends on the amount of the processed order) for your brokerage. Depending on your business, you may also have to configure multiple currency billing. Once set up as outlined, you can execute multiple generic invoice runs - one for each filter in order to create individual invoices for the merchant and the buyer. Remember that this documentation describes one (of several possible) ways to implement this use case. The appropriate setup may vary depending on your individual business requirements. As explained in Billing Arbitrary Objects, the objects based on which invoices are built require a number of ON fields as controlling fields. To support multiple party billing, these source objects require individual, recipient-specific sets of these controlling fields in order to allocate the correct data to the different recipients. To this end, you add an individual suffix string to the controlling fields. The suffix length must not exceed five characters. Create and configure the required controlling fields. For details about the fields required for the generic invoice run, see Configuring Parent Object and Configuring Source Object. invoices for the merchants to request a commission fee. ListPrice * (-1) Reverses the amount to produce a credit. ListPrice Copies the defined list price to produce an invoice. ListPrice * 0.1 Calculates a 10% commission to produce a commission invoice. To support multiple billing, you must configure target-specific filters. To this end, you add an individual suffix string to the filters - following the example, Merch, Buy and Comm. Create the filters as necessary. For details about the filter for the generic invoice run, see Creating Invoice Run Filter. For details about filters in general, see Filters. To completely support the marketplace scenario, you can configure target-specific invoice templates with individually configured texts or table definitions. Create and configure target-specific templates. For each template, specify the text field values and table configurations as required. For details about editing invoice templates, see Customizing Templates.